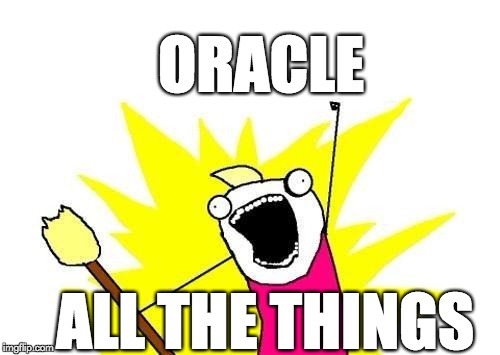 You may or may not know that I (somewhat quietly) re-joined Oracle and the ORDS team in October of 2017. My first task was to work on building screens for Oracle APEX’s REST Workshop so that REST Services would be built on top of ORDS instead of having it’s own separate set of REST service definitions. APEX EA-1 is out now for your perusal, so please go, test, and provide feedback! While I certainly have more to do to help perfect those screens, I’m also embarking on a “little side project” that will hopefully be of fairly broad interest. My goal is to go through the steps I would normally traverse when building an application for a paying client and blog those steps as I go. My hope is that this will be a “soup-to-nuts” example of how I would approach solving problems, implementing designs and building a robust application. There is a lot I don’t know about some of these technologies, so there will be a definite learning curve. I’ll be blogging about that too. In addition, everything I create will be open source and freely available to everyone to use however they want. To keep track of the progress you can follow the cagetory “ALL-THE-THINGS“. I look forward to doing this and getting your feedback as we go. In the next few days I’ll be outlining the application I’ll be building and giving some more details on how I hope to progress. In the mean time, HAPPY NEW YEAR!. great idea, looking forward for the next blog!